Recently I got a chance to see a very interesting lecture by Dr. BJ Fogg on Behavior Design. He is Director at Persuasive Tech Lab, Stanford and runs tinyhabits.com. 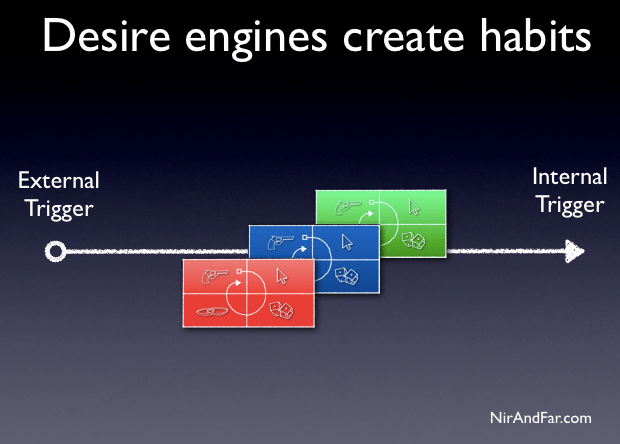 On the other hand I have also been following Nir Eyal’s blog and his concept of Desire Engine. Here I am trying to do something I usually not do – that is, write down some notes and try to compare these two different models. All credits for this post goes to them, all mistakes are mine. It would be even more interesting to try bringing in perspective of “The Power of Habit” by Charles Duhigg – a book I am currently reading in these notes. Maybe Later. My interest in behavior design comes from designing new products. Whether we are designing a web application or a mobile application or a physical product, we aspire to change the user behavior in some manner. And above all, we want to inculcate habit in users to use our product. And heres where behavior hacking starts [Hacking has been the buzzword lately from program hacking to growth hacking to now behavior hacking]. The point he is trying to make is very understandable – For behavior change to occur, one has to be above the Activation Threshold. A good user experience design can make up for low motivation and that is why user experience design is one the most important thing in product design. On the other hand, if motivation is too high and even when behavior change is hard to do, a trigger can lead to behavior change [to use the product]. An anti-UX guy can think that one can always build products that have high motivation value without an easy way to use them. Here comes the third point. Practically speaking, our users and human beings and their motivation does not stay the same forever. For instance, a student who is preparing for an exam goes through ups and downs with his motivation levels to get good marks. So if your product is hard to use, the trigger might not always work. And this might hamper the habit formation – the most important thing we want with our products. The motivation curve can vary across people and the behavior change solicited. The point is that with Hard to use product or bad user experience design, one can risk product adoption in lean periods of motivation. And it is difficult to change habits if user goes on and off with the product. My understanding of this is that desired behavior change can be broken down into mini behavior changes with set of contexts around that can nudge one towards these mini behavior changes. From product design perspective, we can apply it in many different ways. One way clearly I can see is that instead of shoving off a full blown product on the face of the user that require GreenPath change [Do new behavior from now on], we start with simpler things that require smaller behavior changes. 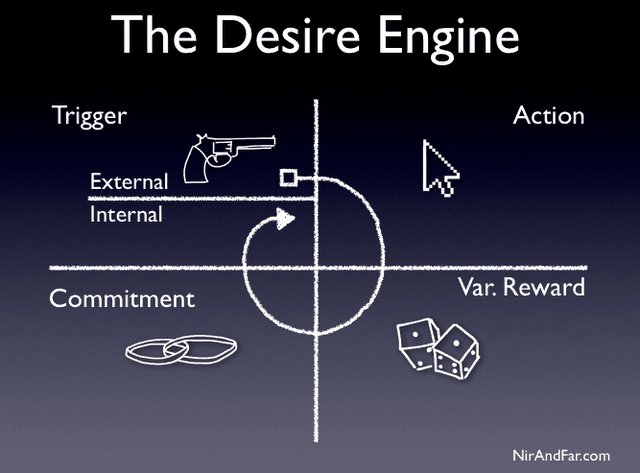 Nir Eyal’s Desire Engine is different to some degree. His examples relate more with web products. These two figures (from his website) describe his model. It starts with a trigger. External or internal trigger. Habits are created when internal triggers become part of routine. And internal triggers are formed with frequent external triggers. Trigger initiates action and it depends on two things whether action succeeds – motivation and ability. I think these two points are same as the behavior model of Dr. Fogg. Nir Eyal’s point is that a feedback loop with predictable response does not create desire. The expectation of a reward to certain action create a dopamine surge but if there is variability in reward, the effect is much more. Once user is in the action, some kind of commitment improves the experience of the user in the next usage cycle. Although he does not mention it, I interpret it similar to what Robert Cialdini talks in his 6 principles of Persuasion – “If people commit, orally or in writing, to an idea or goal, they are more likely to honor that commitment because of establishing that idea or goal as being congruent with their self-image.” Commitment can be in any form – talking or endorsing the product or paying for it. I think both the models start with the same three elements – Trigger-Motivation-Ability – that initiates the product usage or behavior change. However, the two models diverge after that while dealing with enforcement of habit formation. While Nir Eyal talks about variable reward and commitment as two important steps to complete the desire cycle. This desire cycle is then frequently presented to users with improved experience and thus creating an internal trigger and hence habits. On the other hand, Dr. Fogg suggests tiny habits with the power of context to lead to bigger behavior change. I would love to discuss any other such scientific models we can use to design user behavior.